Taking Care of Business ~ The Bucky Channel - The World of Sports from Wisconsin's Perspective. This is how the 4 seed is supposed to operate against the 13th seed. Kentucky and Louisville take note. Wisconsin defeated Belmont 72-58. It was a typical first round NCAA match where the lower seed sticks around long enough to make the higher seed nervous, but in the end, the higher seed wins comfortably due to its superior size, strength, and experience. This was last night's game in a nutshell. The first half and a few minutes in the second half had me just dreading an upset. A few nice possessions at the end of the first half and in the middle of the second half really quenched my fears. Despite almost everyone in the national media sweating Belmont, the Badgers were by far the better team. They started unusually sloppy and Belmont was making some great post feeds over the top in the first half, but as long as Wisconsin played our game, there was no way we were going to lose this one. Along with everyone on the Belmont bandwagon, this win was particularly satisfying due to Wisconsin's trouble as the higher seed in years past - last years squeaker against 14 seed Wofford and 2007's near diabolical against Texas A&M Corpus Christi. The comfortable victory bodes well for the next round, as the Badgers lost the next game in both of those tournament years. The stats will point to Leuer and Taylor as the big time players, but it was very much a team effort. Bruesewitz and Berggren came up huge off the bench and Ryan Evans had a few big plays in the first half when the game was still even. In the end, this was what you like to see in the NCAA. Your team gets some pressure, but fights through and comes out on top without any doubts. The Badgers have advanced to the second round of the NCAA tournament for five straight years, but in 3 of the previous four, they did not make it past the second round. The time the did was at the expense of Michael Beasley led Kansas State in 2008. Let's do it again. 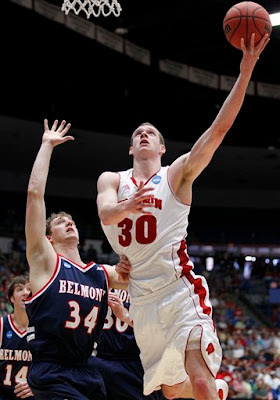 * Jon Leuer was a bit soft, losing the ball several times at the top of the key and in the post. He has got to get on the block and play like a big man. * Turnovers - 12 of them. That is odd. * Our 3rd and 4th best players Josh Gasser and Keaton Nankivil were pretty much non-existent. K-State is a good team, but a beatable team. They have a great player in Jacob Pullen, but I think J-Taylor can cancel him out. They have some strong big men, which could trouble the Badgers. This game will come down to the usual, though, will Wisconsin make its shots. That will be the decider. One thing is for sure, we're going to see lots of camera shots of angry coaches! who wins in a staring contest....Bo Ryan or Frank Martin?